Here’s some lemony goodness to get your spring pucker on! 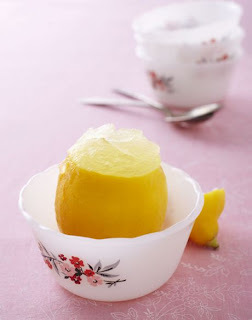 Cut off the top of a lemon, about 1/4 from the top; you’re creating the cup. Save the cap! Cut just enough off the bottom so the lemon can stand up on it’s own. Using a hand held juicer, gently juice the lemon into a fine strainer to remove any seeds and extra pulp (or strain it after juicing). Dilute the fresh-squeezed lemon juice — 3 parts water to 1 part juice. Add granulated sugar to taste (I add about 1 Tbsp. to every cup), depending on how sweet or how tart you like it. Whisk sugar until completely dissolved. Now fill your juiced lemon with your juice mixture to a 1/4 inch from the rim. Place in freezer for 3 hours, or until liquid has reached desired slushiness. Place cap on top and serve with a spoon! If you’re not a fan of lemons, you can make the same dish with blood oranges instead.